The State Fair of Texas is more than just an event. Having run since 1886, it is one of the oldest and most revered traditions in the Lone Star State, along with cotton candy and corndogs. 'Big Tex', a towering friendly-faced animated cowboy figure, greets the crowds who flock to the 23-day fair which offers an abundance of exhibits, entertainment, livestock events, contests, fun rides (including the massive Texas Star ferris wheel) and parades. Food is a huge focus of the fair, in 2005 with the addition of two annual food contests at the fair - a prize for the tastiest offering, as well as a prize for the most creative offering. The tastiest offering has gone to dishes like buffalo chicken in a flapjack and fried bubblegum. Aside from food, there is a main stage as well as a smaller stage that provide live musical entertainment throughout the duration of the fair. A culinary stage hosts celebrity chefs doing cooking demonstrations, usually with a focus on Texan specialties, and an auto show annually exhibits more than 400 newly released cars. The Classic Corral portion of the auto show puts som ebeautifully maintained classic cars on display. 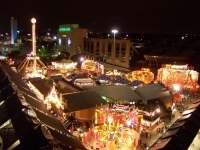 The Texas State Fair is the largest in the US, and the family-friendly spectacle makes a fun day out for anyone visiting Dallas in the autumn.